Division, of General Motors, Detroit Michigan, in April of 1945. 49,243 of all versions were built from 1942-1945. Europe from 1943, but all these tanks were disposed of in Europe at the end of the war. to running condition in private ownership. (W) – Pressurized wet stowage of ammunition, HVSS – Horizontal Volute Spring Suspension. 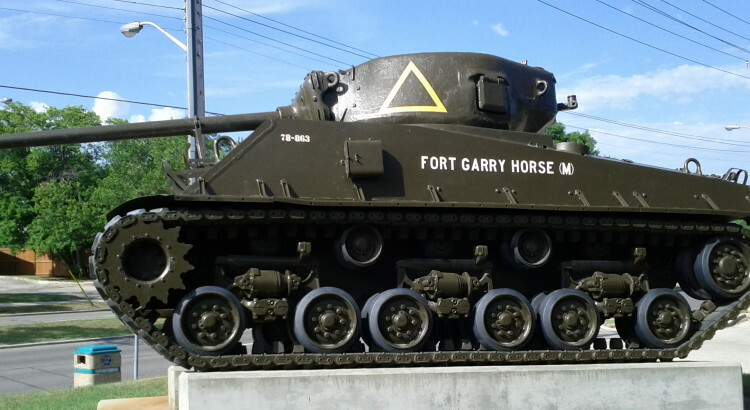 The vehicle carries the marking of The Fort Garry Horse (Militia) for the period 1946-1959.
flash was carried until 1968 and the unification of the Canadian Forces. added to the sides of the vehicles located in Winnipeg for recruiting purposes. It takes two gallons to paint the entire vehicle with a professional spray gun and compressor. Rubber road wheels and support rollers – Tremclad Flat Black, painted by brush. Grease points on wheels – highlighted in red. Markings. Gloss Red, Yellow and White Tremclad spray paint. filled its ranks and began to receive equipment and train as sword and rifle armed cavalry. October 1914, and trained there as Infantry throughout the remainder of the year. highest honour, the Victoria Cross, for this action. and came home to Winnipeg in 1919.
continued to soldier on throughout the 20’s and 30’s keeping standards and traditions alive. they continued to train for the planned invasion of Europe. into Germany and fought successfully in many actions earning 16 Battle Honours. Garrys served in the Korean War as First Troop “A” Squadron of Lord Strathcona’s Horse. Egypt, the Golan Heights, and the former Yugoslavia. in the Sinai and Cyprus. The Regular component was de-activated in 1970.
assistance in blizzards, and the yearly tradition of delivering Christmas Cheer hampers. The tank in service with The Fort Garry Horse, 1959.
manufactured in 1945, incorporating many changes learned from wartime experience. Intercom Headset and handset for each crew member. • Fixed fire extinguisher system controlled from inside or outside vehicle. • 1 powered intake ventilator in hull roof, 1 powered exhaust ventilator in turret rear. • Emergency escape hatch in hull floor behind bow gunner. • Internally controlled searchlight mounted on turret roof. Grenades 3 types: No 36 HE, No 80 Mk1 WP smoke, No 82 Mk 2 smoke. Turret traverse: Hydraulic: gunner’s hand control with commander’s override. Manual: manual traverse handle for gunner. Manual: handwheel controlled by gunner.